Rugs can be very difficult to clean properly. Natural fiber such as Wool, Silk, and Cotton, Can not be cleaned or spotted with the same products used for synthetic carpets. It’s easy for a un-trained carpet cleaner to accidentally damage a rug when trying to get rid of a spill or a stain. This can ruin a rug completely, which makes it a very costly mistake. You should also know that over the counter spotting products are not intended for natural fiber rugs, they are intended for Synthetic fibers only use if the product states “Woolsafe” on the product. But a professional rug cleaner knows exactly what they’re doing. They’ll handle your rug with care and make sure it looks better than ever. If there are any mistakes, they’ll be covered under the cleaner’s guarantee. Your rug will be protected no matter what happens, which you can’t say when you clean it yourself. You may think that your rug can go without regular cleaning. However, that isn’t a good idea. Dirt filters down into rug fibers and become impact with the knots of the foundation, making it difficult to vacuum. Rugs absorb a lot of germs, allergens, and bacteria, which makes the air around them unhealthy to breathe. They need to be cleaned periodically, and that cleaning needs to be thorough. A professional rug cleaner is up to that task. They have heavy duty cleaning equipment that can get all allergens, germs, and bacteria out of your rug. It’ll be as if your rug is brand new again. Even if you can’t see a difference, you’ll be able to feel it when you breathe. 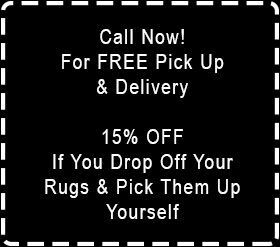 Anyone who owns high quality rugs should strongly consider hiring a professional cleaner. It’s the best way to keep their rugs clean and in excellent shape. Rates are fairly affordable, and the service you get is more than worth the cost. Call a cleaner today to get a quote.